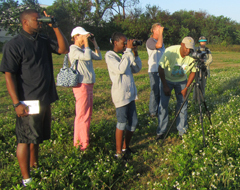 Freeport, Bahamas - The annual Christmas Bird Count (CBC) was held on January 4th. Erika Gates of Grand Bahama Nature Tours who has been organizing the count over the past 9 years was delighted with the results. “We recorded a total of 110 species, whereby 99 were observed this past Saturday and an additional 11 during count week, a period 3days prior and 3 days after count day! I am also pleased with the number of participants that turned out for this year’s event which reached 35!”, from sunrise to sunset on Grand Bahama Island. Freeport, Bahamas - During the final months of this year nature enthusiasts, researchers, scientists and conservation leaders throughout the Caribbean and the Bahamas joined in the celebration and promotion of public awareness of the miracle of bird migration. Freeport, Bahamas - Once again, the Garden of the Groves family is pleased to announce its participation in the annual International Migratory Bird Day (IMBD) activities. Along with the Society for Conservation and Study of Caribbean Birds (SCSCB) we will spend the entire month of October educating our community. The main objective is to heighten everybody’s awareness of the thousands of migratory birds that pass through the Bahamas or spend the winter here and find ways to protect their habitat. 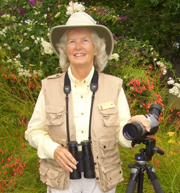 Co-ordinator, Mrs. Marilyn Laing, states, “We want to share the message of bird conservation with everybody and due to the interest by so many..."
Come join us next Saturday, June 29th for our June Fieldtrip. We will meet at Thompson's parking lot at the Reef Golf Course and will bird there from 8 until about 11 am. Those of you who would like to see a Bahama Woodstar sitting on her nest may visit her afterwards at Grand Bahama Nature Tour's property. By Saturday the babies may have hatched! Bring your cameras! Freeport, Grand Bahama Island - The annual Christmas Bird Count (CBC) is conducted in the United States, Canada, the Caribbean and the Bahamas by over 500,000 birding enthusiasts. Birds are counted in the same areas each year for one day from sunrise to sunset during the months of December and January. By participating in this count Grand Bahama Birders contribute valuable information to the longest running database in ornithology. 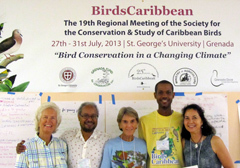 Freeport, Grand Bahama island - During the final months of 2012, Conservation Leaders, Researchers and Nature enthusiasts from the Caribbean and Bahamas joined forces to celebrate and promote public awareness surrounding the miracle of Bird Migration. While there are threats of development and illegal hunting that continues to endanger the habitat of birds, nearly 350 species of these birds make their annual migration between their summer homes in the U.S. and Canada and their winter homes in the Caribbean, Bahamas and South America. Our December Birding Fieldtrip will take us to the Emerald Pond, the Ruby Golf Course and to the Reef Ponds as well, where we will be searching for the beautiful Purple Gallinule which has usually arrived by now at either of these locations. We will meet at 8 am on Saturday, December 15th at Thompson's Parking lot at the Reef Golf Course. Freeport, Bahamas - Our November Fieldtrip this past Saturday at Garden of the Groves gave us the opportunity to welcome many of our fall migrants like Ovenbirds, Black and White Warbler, Northern Parula, Louisiana Waterthrush, Prairie and Palm Warbler and Black-throated blue Warbler. A Sora and Wilson's Snipe were also observed that same morning at the little wetland near Island Seas Resort. The highlight of the morning came for those that decided to join meto check on the survival of a tiny Bahama Woodstar nest after hurricane Sandy near the resort! The two youngsters were fine and thelittle nest was solidly "cemented" on a Casuarina branch and had not budged throughout the storm! 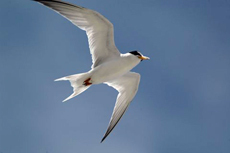 Grand Bahama birders conducted their annual field trip to Peterson Cay, home to a nesting colony of over 200 Bridled Terns. Bridled Terns are pelagic birds which means they spend their lives at sea and come only to land during their breeding season in the summer. They lay a single egg in limestone crevices on uninhabited offshore cays and islands. Freeport, Grand Bahama - Some of you remember last year's trip by kayak to Peterson Cay to survey the Bridled Terns nests and young. Our researcher friend Irene Lieu captured the photo of a chick hatching from the egg as mother is watching! 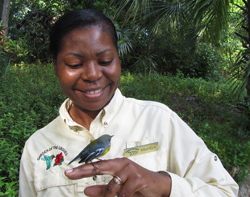 Freeport, Bahamas - More than 50.000 observers in Canada, the United States, the Caribbean and the Bahamas participate each year in an all-day census of migratory and resident bird populations. 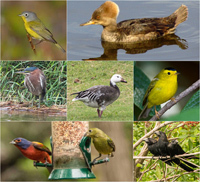 The primary objective of this "Christmas Bird Count" is to monitor the status and distribution of bird populations across the Western Hemisphere. 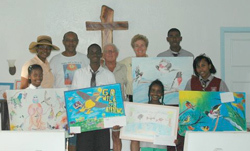 A new birding trail has been established in McLean’s Town, Grand Bahama on Saturday, 26th November, 2011 when nineteen (19) birders from Freeport, along with the principal of the All-age School in McLean’s Town, Mrs. Dorothy Lewis and a student from Grade 6, Georgette Laing joined Mr. H. Rudy Sawyer through the trail that he had developed over the previous three (3) months. Mr. Jock Hall, professional photographer, video taped the expedition. Among the birders were Mrs. Erika Gates of Grand Bahama Nature Tours and top naturalist on the island, who organized the birders and transported them to McLean’s Town from Freeport; Mr. Shamie Rolle, owner of Calabash Tours and a leading naturalist and birder on Grand Bahama; and Ms. Renamae Symonette of the Ministry of Tourism - Sustainable Tourism Division. 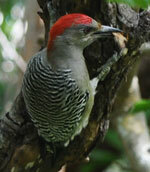 Freeport, Grand Bahama - A rare visitor to Grand Bahama – a West Indian Woodpecker – enjoys a lizard it dug out of the bark of a tree at McLean’s Town at the weekend. The bird has not been spotted on the island since the two major hurricanes of 2004 and its return is further evidence of how nature is gradually recovering seven years later.